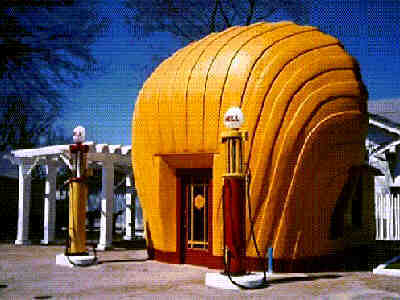 A one of a kind shell-shaped 1930 Shell gas station at Sprague and Peachtree Streets in Winston-Salem, North Carolina has been restored by Preservation North Carolina, an architectural preservation group. The Quality Oil Company, a local Shell gasoline marketer, had eight similar stations built in the 1930s by R.H. Burton and his son, Ralph. Constructed of bent green wood, wire and concrete stucco, the building is a non-verbal advertisement of the Shell Oil corporate symbol. Eighty-nine year old L.L. "Fuzz" Everhart, who managed the station in the '30s and 40s, said "If it had fallen, it was just a piece of history that could never, ever be replaced." 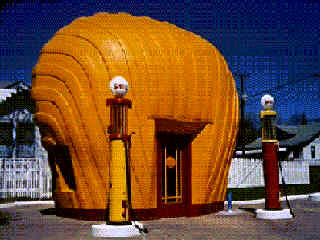 The other "shell" stations are long gone. This specimen lived a second life as J. Don Watson's lawn mower repair business. He rented the vacant structure in 1970 and bought it in 1980. Watson remembers warming himself by the stove there on cold mornings when he was a young boy serving as a crossing guard at that intersection. Recognizing its historical value, Preservation North Carolina spent a year and $50,000 bringing the landmark back to its original lustre. 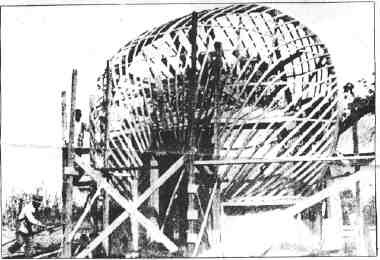 The group was successful in placing the site on the National Register of Historic Places. They have a 15 year lease and are using it as a satellite office. For more information about Preservation North Carolina and this classic Shell station call Sarah Woodard at (910) 721-7300. The design of this station ensured there was no doubt about the brand of gas sold there even if a passerby missed reading the signs.